This article represents the third installment of a three-part series discussing the potential for embezzlement within an organization by its Accountant Bookkeeper Office Manager (ABOM). Part one discussed how the ABOM could mishandle incoming cash receipts to commit fraud. Part two discussed how the ABOM could mishandle outgoing cash disbursements to commit fraud. 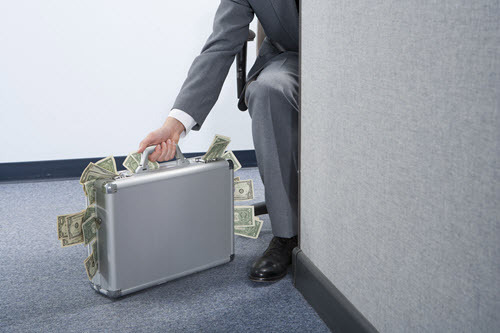 This article will be discussing how an ABOM can alter payroll data to embezzle cash. There are two types of payroll schemes that a law organization can fall victim. An ABOM can engage in a ghost employee scheme or a falsified hours and salary scheme. The easiest way for a ghost employee to be added to the payroll system is by the person who has authority to add and remove employees. The ABOM with said authority then becomes the most likely suspect for adding ghost employee’s to the organization’s payroll. It is uncommon, but possible, for a lower level employee to gain access to the payroll; they should not be discounted. However, it is generally the person with the authority to add new employees to the system who are most suspect. To attempt to conceal their fraud, the ABOM may add the ghost employee with a very similar name to an already existing employee so that at first glance no one would suspect the fraud. An example of this is if the organization employs a Joe Smith, and the ABOM adds a ghost employee named Joe Smithe. Another method of concealment is to leave terminated employees on the payroll system and begin re-routing their payroll checks to the corrupt ABOM. Once the ABOM can establish a ghost employee on the organization’s payroll system, they need to get time and wage information in. If the ghost employee is coded as hourly, timecards are going to need to be input and a wage rate needs to be established. To falsify a timecard for the ghost employee, the ABOM may log into the time system and add hours to the ghost employee, create, and sign a timecard with the ghost employee’s name, or punch a timecard daily for the ghost employee. The biggest hurdle for the corrupt ABOM is getting the timecard approved. Again, the easiest way for this to go undetected is for the person with the most authority to be the person who creates the ghost employee. If the ABOM creates ghost employees who are salaried rather than hourly, it removes the need to create and maintain timecards altogether, thus making it easier to carry out. After getting the ghost employee set up in the system and establishing a timecard and wage rate, they will be issued a paycheck. This step may not be at the hands of the ABOM. It is done by the person who is responsible for printing and signing the paychecks. If there are segregation of duties in place, it would be uncommon for the ABOM to also partake in this step. The issuer of the paychecks does not need to know or be involved with the fraud for the paycheck to be successfully issued to the ghost employee. Finally, the paycheck must be delivered to the ghost employee. Unless the ABOM in this scheme is entrusted with not only preparing the payroll data, but distributing the paychecks, then it becomes extremely simple for them to just pocket the paycheck. However, usually paychecks are distributed either by mail or through direct deposit. If that is the case, then it would be necessary to have entered the information for the ghost employee so it was deposited into a bank account the ABOM has access to, or mailed to a location where the ABOM could later retrieve it. It is possible this is easily detectable because the ghost employee and the corrupt ABOM share a mailing address or bank account number. In other cases, that can be concealed by sending the paycheck to a PO Box or a separate bank account set up just to receive the embezzled funds. This is the most common method an ABOM may use to misappropriate payroll funds. Whether the employee is hourly or salaried affects how the paycheck can be altered. An hourly employee can opt to inflate their hours or increase their wage rate, where as a salaried employee can only increase their wage rate. If the employee is hourly then it is important to understand how their time is input, for instance, they may have a time clock they utilize to clock in and out, they have login codes that track the amount of time spent on each job, or they manually enter their time. When an hourly employee is responsible for manually inputting their hours worked, it becomes easy to falsify the amount of hours worked. The biggest issue with the manual timecard is getting a supervisory signature on it when the hours have been falsified. It is possible that the corrupt employee may forge their supervisor’s signature or collude with their supervisor. If collusion occurs, the employee may kickback some of the overpaid wage to the supervisor as an incentive. In a law organization, it is usually the ABOM responsible for preparing the payroll checks that receives the timecards, thus making it extremely easy for them to falsify the hours. If the ABOM is a salaried employee then they are only concerned with being able to adjust the rate of pay. If the ABOM is tasked with maintaining the payroll data, it will be very easy for them to adjust their rate of pay within the payroll system. If this is not the ABOM’s function, they will need to collude with an accomplice to get the rate of pay in the organization’s system adjusted so that they receive a larger paycheck. Often, the person who is responsible for maintaining this information is high suspect as the corrupt employee in this type of embezzlement scheme. This article series is reprinted with permission from the author as previously published on McGovernGreene.com. 2016 Fraud Examiners Manual, page 1.456. Craig L. Greene, CPA, CFF, CFE, MAFF, MCJ, is a founding partner of McGovern & Greene LLP, a forensic accounting CPA firm with offices in Chicago and Las Vegas. Mr. Greene can be contacted at (702) 818-1168 or by e-mail to Craig.Greene@mcgoverngreene.com.